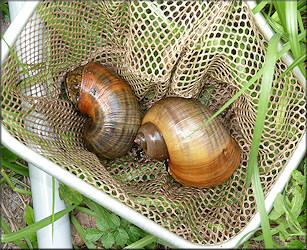 During a terrestrial snail survey on June 21, 2012, this reporter discovered a Pomacea maculata population in a lake near 14389 Old St. Augustine Road adjacent to a Royalty Express gas station and near the Old St. Augustine Road bridge over Julington Creek (see: Daedalochila auriculata (Say, 1818) On Old St. Augustine Road and Daedalochila peninsulae (Pilsbry, 1940) On Old St. Augustine Road. About a dozen Pomacea egg clutches were present on a concrete culvert/overflow spillway but no actual snails were seen. Circumnavigating the lake, additional egg clutches were seen on structure at various locations on the shoreline but again no actual snails were found. Continuing the investigation, two mating Pomacea were finally located in a small ditch/creek below the overflow spillway as well as several fresh egg clutches. The next day a follow-up survey of the area was conducted and two additional live Pomacea were found in the drainage ditch/creek as well as additional fresh egg clutches. 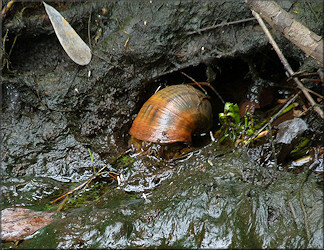 Continuing downstream, two egg clutches were found where the overflow ditch/creek enters the Julington Creek flood plane suggesting that the snails have entered Julington Creek proper. Both the lake and the overflow creek/ditch have been under surveillance on a periodic basis for over two years and this is the first indication that Pomacea were present. 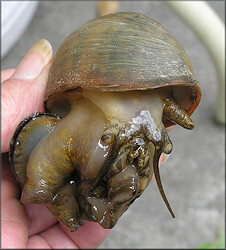 The size of the live adult snails found, over 80 mm., indicates that they have been present during that entire time period. 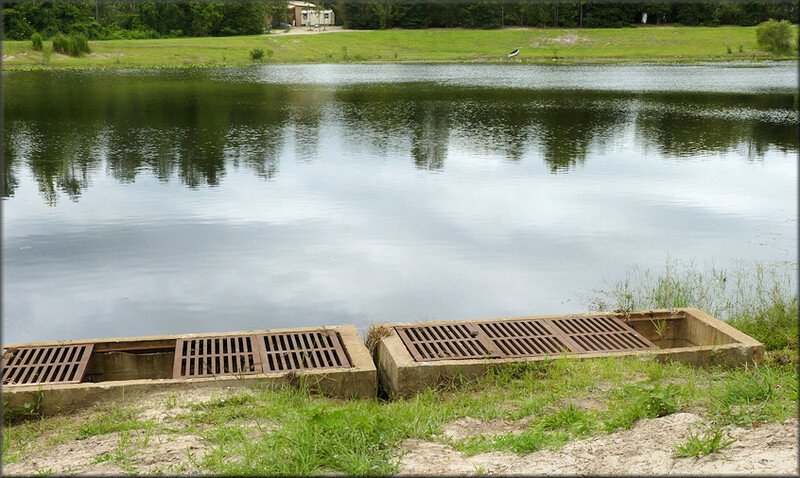 Addendum: During a follow-up survey of the area during early May, 2016, no indication of the continued presence of Pomacea maculata could be located in the lake, the spillway or downstream ditch/creek. 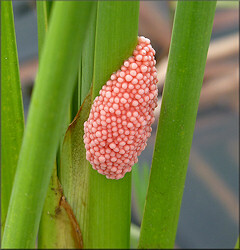 However, on 5/17/2016 a single large Pomacea maculata egg clutch was seen on vegetation in Julington Creek proper just south of the Old St. Augustine Road bridge over the creek. This is the first confirmation that the snails have in fact colonized Julington Creek.